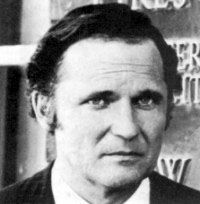 John Vernon was a steely-eyed, pockmarked, mean-looking Canadian actor with a deep, resonant voice, who usually played bad guys. In his film debut, Vernon was unseen, but provided the voice of Big Brother in the 1956 Edmond O'Brien version of Orwell's 1984. In his most famous role, he was the Dean of the fictional Faber College in National Lampoon's Animal House with John Belushi. On TV, Vernon voiced The Sub-Mariner, a cartoon based on the Marvel comic, and he starred on Canadian TV as Wojeck, a crime-solving coroner long before Quincy or CSI. "I did only 20 episodes of the show as the crusading coroner," he later recalled, "but the reaction was so strong that it reached the attention of some Hollywood producers, who brought me to L.A."
In Clint Eastwood's original Dirty Harry, Vernon played the mayor of San Francisco. He also had supporting roles in Tell Them Willie Boy Is Here with Robert Redford, The Outlaw Josey Wales with Eastwood, Airplane II: The Sequel with William Shatner, and Ernest Goes to Camp with Jim Varney. He received the Animal House role only after Jack Webb turned it down. The film's director, John Landis, said Vernon was delighted to be given a rare chance to do comedy. "Who dumped a whole truckload of fizzies into the swim meet? Who delivered the medical cadavers to the alumni dinner? Every Halloween the trees are filled with underwear, every spring the toilets explode." Vernon also played Dean Wormer in the short-lived sitcom Delta House, based on Animal House. He never achieved major stardom, and often chuckled about being mistaken for Richard Burton, Robert Shaw, or Patrick McGoohan. "Everybody's seen my face but nobody's sure who I am. People confuse me with other people and I enjoy that."